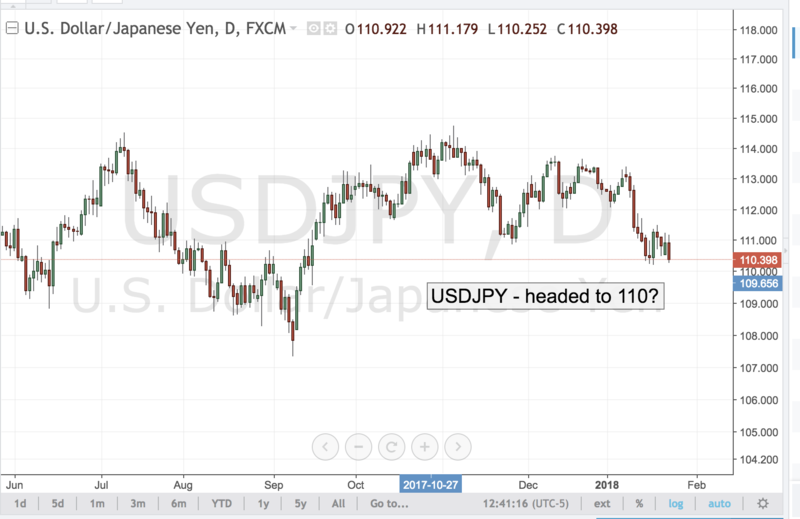 USDJPY – Heading to 110.00? USDJPY cannot hold its gains. Despite a dovish BOJ, despite a budget deal in DC, despite US yields trading well above the 2.50% on the benchmark 10 year, the pair remains in sell the rally mode. Tomorrow the market will get a smattering of 2nd tier US housing data, but the focus of the market will be on technicals levels. The longer the bears control the field of play, the more likely it will be that 110.00 will be run. 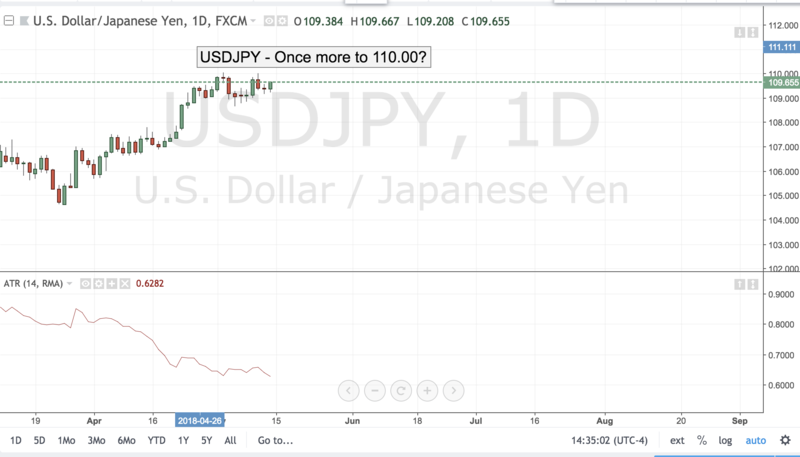 USDJPY – Back to 110.00? One of the better setups in trading is when the news on a pair is positive but the price action is negative. 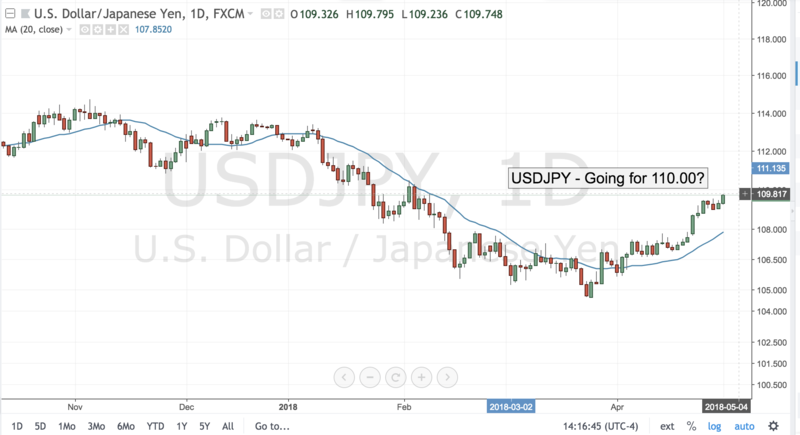 That suggests further downside action for USDJPY which saw just this dynamic today as it failed to hold fresh highs after a strong ADP number. 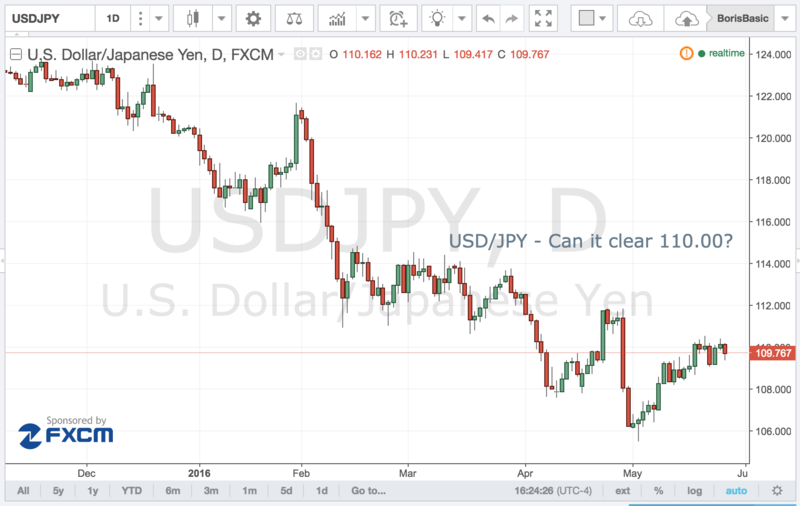 So any disappointment in tomorrow’s NFP report could quickly turn to a selloff in USDJPY which could take it towards the key target of 110.00 as short press their case. The EURUSD powered its way to fresh multi-month highs breaking above the 1.0950 level and rising all the way to 1.0985. 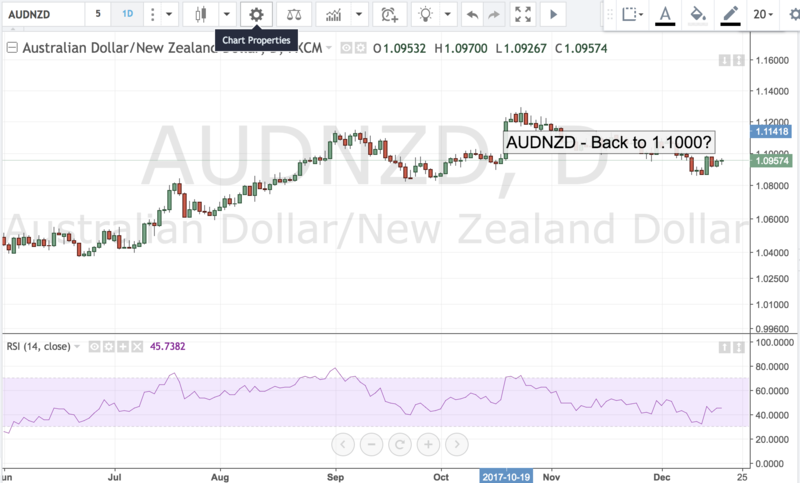 The pair is within the striking distance of the key 1.1000 figure that it hasn’t seen since last year and could break it in Asia session trade. Over the next 72 hours, however, the pair faces two very important event risks. Tomorrow’s NFPs and Sunday night’s French election results. Both could prove beneficial to the pair and seal its rise above the 1.1000 level. If the NFPs prove soft, especially on the wage front, the nearly universal assumption that the Fed will hike rates will come under doubt and yield differentials between Treasuries and Bunds could compress sending euro higher. Then on Sunday, a solid Macron win would ensure the status of EU and will create another wave of relief buying in the pair. 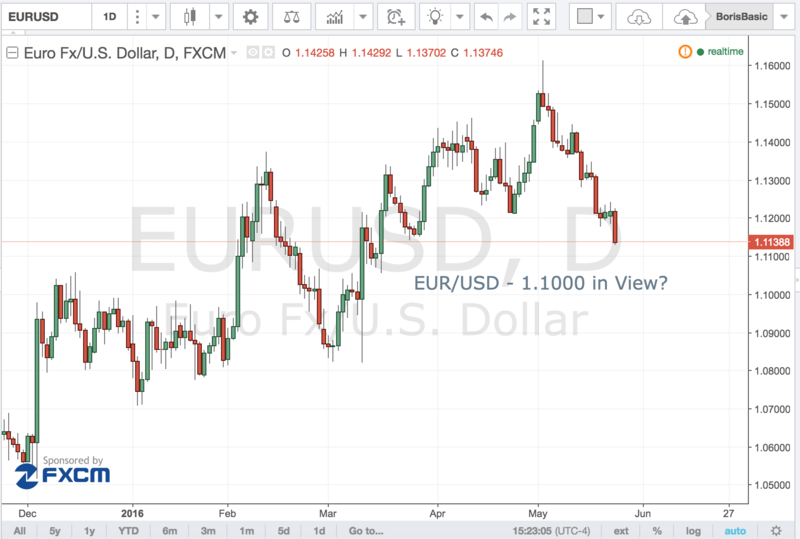 There is a risk that much of the good news has been priced in, and the EURUSD could see a sell the news dynamic later on the week, but for now all roads lead to the 1.1000 figure as sentiment looks solidly euro bullish. 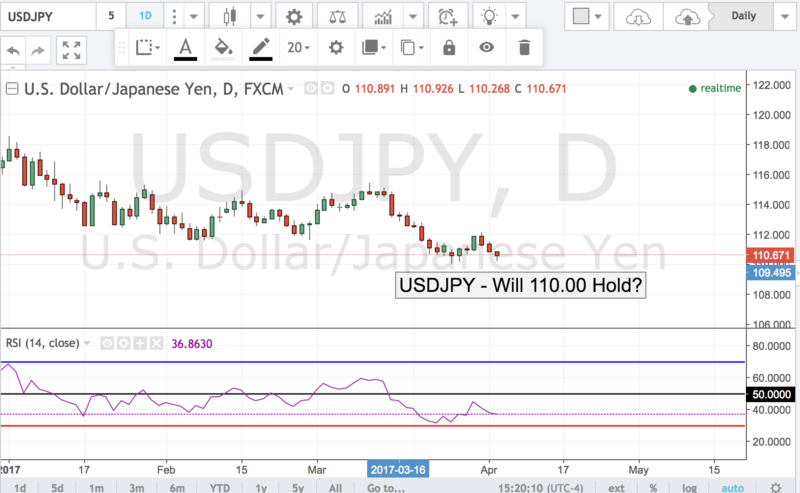 USD/JPY – Can it Clear 110.00? 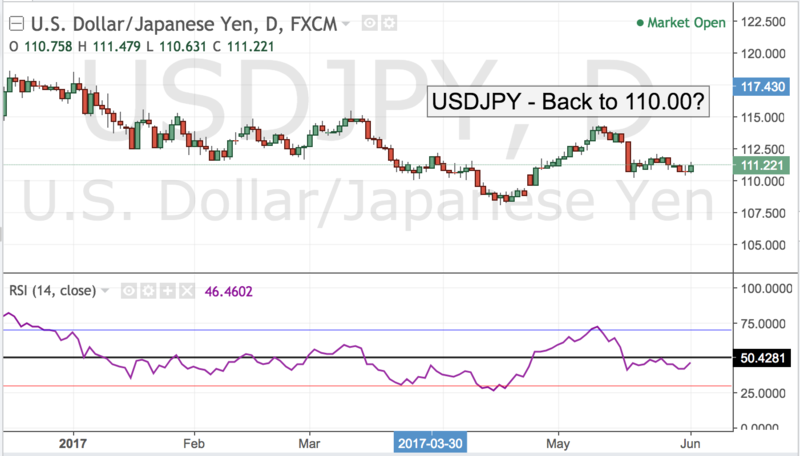 For the past week USD/JPY has had trouble with the 110.00 level. It has mounted that figure more than several times but has not been away to pull away and has barely broken 110.50 only once to pull back once again. 110.00 was the key breakdown level so it only seems natural that the pair will find some resistance there but for the uptrend to continue it needs a conclusive break through 111.00. Tomorrow’s US GDP figures may provide some support if they print hotter than forecast The market is already expecting a bump to 2.1% from 1.9% on the initial reading, but the true test of the buck may not come until next week when we see the NFP report. If the labor data proves positive chance of a June Fed hike will rise markedly and will help fuel the breakout the bulls are looking for. EURUSD – 1.1000 in View? EUR/USD has been sliding ever since the hawkish FOMC minutes last week and today it hit an 11 week low breaking below the 1.1150 barrier. The pair is starting to finally feel the pain of interest rate differentials as the Fed look clearly to tighten while the ECB will remain stationary for the foreseeable future. Tomorrow the market will get a glimpse at the IFO survey data and given the fact both flash PMIs and ZEW survey have missed their mark the IFO is likely to disappoint and could push EUR/USD to a test of the key 1.1100 support. A break there could open a up run towards the psychologically key 1.1000 level as the euro long continue to unwind their positions. 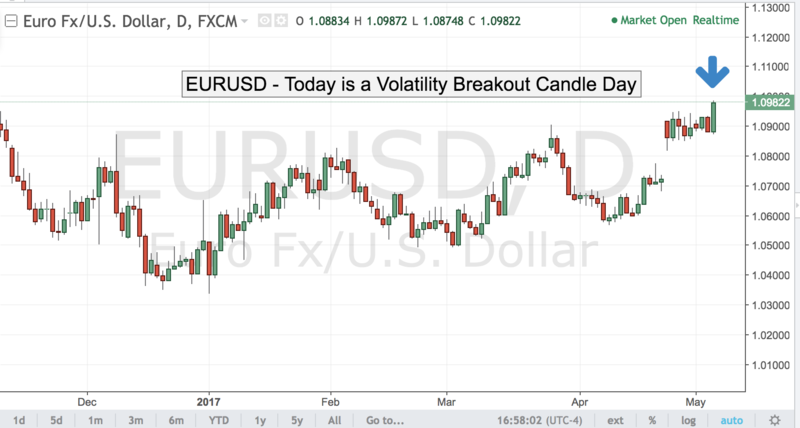 EUR/USD – Back to 1.1000? A combination of a sell off in the dollar ( led primarily by rebound in oil ) and a coming of terms between Greece and Eurogroup has resulted in a massive EUR/USD rally that recovered four days worth of losses in just one session. The agreement between Greece and EG -- if it happens will definitely relieve some of the pressure on the pair. However, the euro has much bigger problems to worry about. The latest economic data from the PMI’s has shown that the region is taking a step back. If tomorrow’s IFO survey also shows a deterioration of conditions today’s rally may be one day wonder. 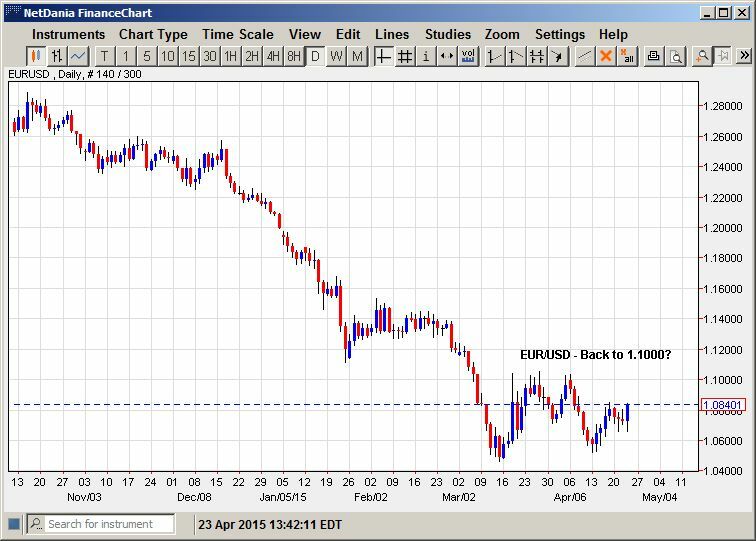 Technicals for the pair look relatively sound with the euro making a higher low at 1.0600 level. For now however the 1.1000 looks to be formidable resistance, so any push higher should be limited in scope.